If those Engines had any foresight, they were talking about the ways in which the transcontinental railroad, and the entire railroad network, inaugurated a national transportation and communications system, a truly trans-continental marketplace for the passage of goods, a much larger-scaled industrial capitalism than ever before, and a larger-scaled labor movement to oppose it. 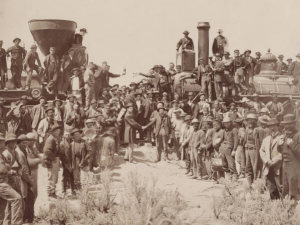 They were discussing the various groups whose lives were transformed and in some cases destroyed by the railroad: immigrant railroad workers and settlers of the West, Plains Indians, bison, and captains of industry. That rail line made possible the mass settlement of the West, and, as those who conceived it may have predicted, it changed the course of American history. The History Project at University of California, Davis, invites K-12 teachers from around the country to spend a week of summer 2019 learning about the Transcontinental Railroad from its conceptual origins, through feats of labor and engineering, and on to its social, political, and economic impact during and after the Gilded Age. This NEH Landmarks of American History and Culture will be offered twice: June 23-28 and July 7-12, 2019. Please indicate your preference and availability on your application due March 1, 2019. Most of our sessions will be held in Sacramento; the UC Davis Department of History serves as the institutional host. The department is home to the History Project (HP), a unique community of K-16 educators committed to raising student achievement by teaching history in challenging and exciting ways. Having been engaged in professional learning for local teachers for over 20 years, we are uniquely positioned to make this NEH Landmarks of American History and Culture workshop especially valuable to educators. The HP team consists of teachers, teacher educators, and scholars whose involvement assures that all of our NEH Summer Scholars will benefit both intellectually and professionally. Our Directors Prof. Louis Warren from UC Davis and Stacey Greer from The History Project at UC Davis have a great deal of experience in working with teachers. For more the faculty and staff associated with this workshop, click here.